The beach is pristine. Perhaps there are branches or sticks inside the jungle, another 400 yards away. Heading over to the jungle. It’s closer and it’s going to have leaves. Emral is going to grab a branch and cover his tracks. What does he see in the jungle? Cannot see into dense foliage. From this distance it looks impenetrable. Emral goes to it and grabs a branch. And cautiously, in case of being watched. The huge, numerous leaves form a dense wall. Emral grabs a stalk, his fist not even closing around half the circumference. So... all vines? Okay, then off to the marsh Emral goes. Cautiously, aware of the potential danger but excited by the adventure. He laments the loss of his weapons (and spell book?) and hopes to find some suitable replacements soon. But how could such be found on so remote a place as an island in the seas of lost Hyperborea?! Ooc: fixed the last post. Emral, empty-handed and in rags, trudges toward the marsh as thirst becomes a gnawing concern. His mind reels with his memorized spells, now fearful of casting them away. The tide has come in and the marshy swamp is covered in floating seaweed. The tall marsh grasses sway in the wind. All seems natural but - There is a piece of parchment caught between the reeds of the grass 20 yards ahead. Emral rushes to the parchment and investigates. Emral plunges into the incoming seawater. Quickly he's up to his knees in the mud. But he manages to grab the paper. It's not parchment, it's paper, soaked and torn. And it's been burned. Charred, scorched. A page from a hymnal, a psalm to Boreas. Emral heads back to dry land, then reads the page. Anything specific, like an invocation? 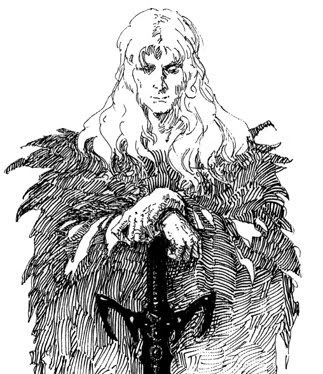 Emral is areligious, like Elric was in those books- summoning is one thing but not actual worship of elementals like boreas. In the ruined books, in the scorched church from last night's wicked dream! Emral keeps the paper and looks for anything else that blew in on the wind. Does he see anything else among the reeds? But he swears something just brushed along his leg under the water. ooc: uuuuuugggghhh, rolling dice ugh rolling dice! Emral scrambles back to the beach. and notices something large has washed up in the cove. Emral goes closer, provided it doesn't look like something that can eat him.